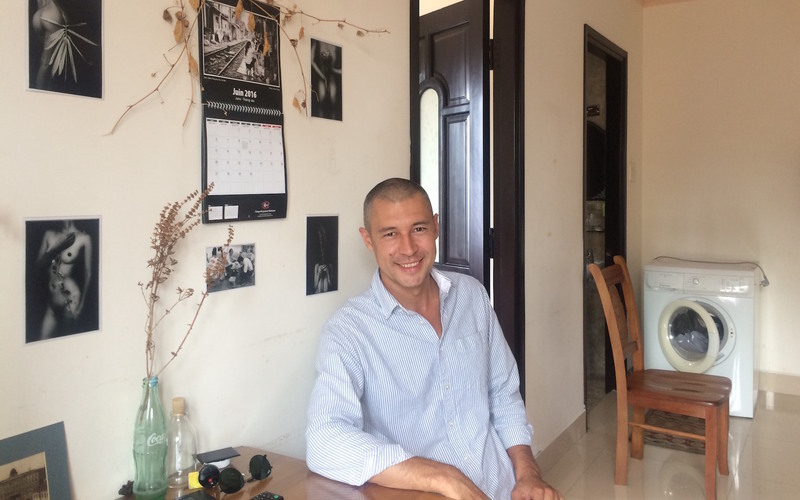 We met Alisher — an ILA English teacher on Tuesday afternoon in his apartment in Thao Dien (District 2). For our Hoozing team, he is one of the most special customers who searched for an apartment with us back in November 2015, and last month he also shared the information of his apartment and was able to earn 140USD before moving out. We consider him as our friend rather than customer now, as he shared with us not only his experiences using our website and services but also market insights from 8 years living in Hanoi to improve the company better. How was your experience looking for a place to stay with Hoozing? My requirements were clear and simple. I wanted the apartment to have big window with a view, which means not facing any cold brick wall and a proper gas stove in the kitchen. However, the real estate agents always wasted my time by showing me places where things would be opposite to my expectations. Some even tried to convince that I was wrong and those houses were the best options available for me. The house searching experience was so negative until I found Hoozing and worked with your executive — Cuong, who only sent me house options that exactly fit my requirements and stayed patient, when it took me the whole week to give the final answer. After I moved in, there were several problems related to the neighborhoods. I always left the room windows opened for fresh air however the noise outside kept irritating me. The dogs of one neighbour, that were rescued from shelters had some mental problems so they barked with no reason. Another neighbour had problem with his AC, it made loud noise as the holder was loosely attached to the wall. I messaged Cuong and even though he couldn’t take any immediate action, he quickly replied and advised on what to do. I personally appreciate that act of understanding and support. How was your experience trying Hoozing new concept of “earning while moving out”? It is really a good concept. It took me a few minutes to list my apartment on Hoozing website, there were some bugs but again, your executive was super fast to help solving it. Li Lu — a girl from US contacted me and I spent 30 minutes chatting with her. Very soon I realised that Li didn’t know much about the life in Vietnam as this would be her first time in Asia, therefore I answered her in details everything, from how to rent a motorbike to which supermarket was close to the house. Maybe that’s one of the main reasons she decided to take the house and paid the deposit online, even when it was still one month before her arrival in Vietnam. When I first came to this apartment, the kitchen was empty and I couldn’t even have a cup of water or make myself some tea. Therefore this time I decide to leave her the water kettle, some cups and some bags of good tea so that she can enjoy herself and feel like home immediately after moving in. With the vision of building a Community of Renters in Vietnam, Hoozing currently have more than 500 available listings and many of them are directly uploaded by the current tenants. We incentivise them by sharing 50% market commission (e.g. one month rent for 12-month contract) when there is new tenant moving in. More information about this concept can be found here.